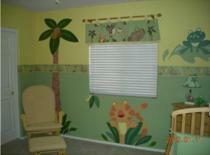 All the Safari and Jungle Theme Nursery Ideas, Decor and Bedding You Need to Create a Tropical, Wild Adventure in Your Little One's Baby Nursery. 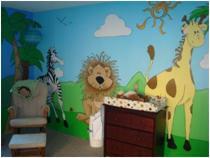 Take a walk on the wild side through the jungle tropics or a safari through the breathtaking savannah plains with a baby nursery decorated in these ever-popular nursery themes. 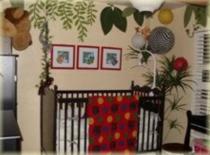 A jungle or safari nursery theme is perfect for a baby boy or girl, it will delight your little one right through toddlerhood and it's easy to create. 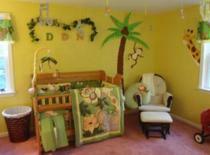 There are loads of gorgeous jungle theme nursery decor options available on the market and it's easy to add your own special touches. 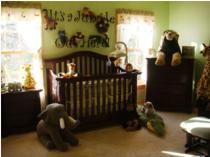 From swinging monkeys to lazing lions, there are plenty of creative and colorful ways for you to bring the call of the wild into your baby's room! 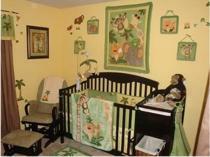 You'll also find a world of howling ideas in the wide range of jungle baby room decor available on the market. 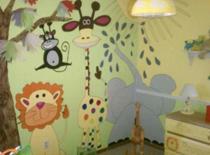 From contemporary wall art to cute and cuddly jungle animals, you'll find everything you need to decorate your jungle theme nursery at our Jungle Nursery Decor Store. 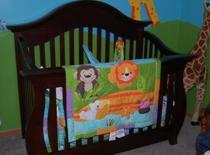 Or visit the African Safari theme section at ababy.com. 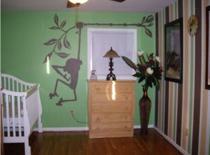 You'll find plenty of mix and match jungle theme decor all in one place. 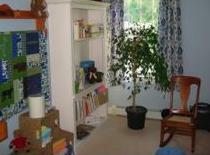 Furniture, bedding, lighting, rugs and more. Everything you need to create a rumble in the jungle! 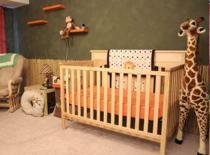 Click here to go to the ababy.com Jungle theme nursery section. 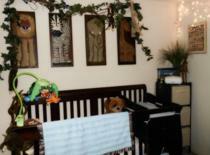 If you are decorating a jungle theme nursery enter it in our baby nursery photos contest here. 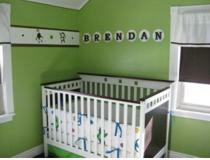 You could win a great prize and we will add your nursery to this page to inspire other moms! 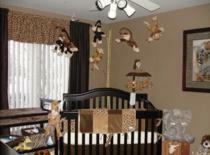 Neutral shades of beige and brown with splashes of animal color if you want to recreate the African Savannah in your nursery. 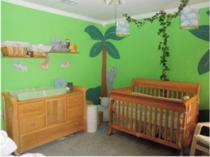 Natural greens and browns for a tropical jungle look. 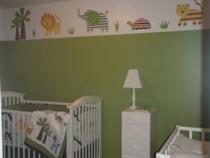 For a more cute and cuddly jungle theme you can choose between bright or pastel shades of orange, blue, green and yellow. 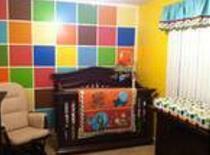 You can achieve a more modern look by combining a couple of bold colors or an animal print with a white or off-white background. Natural Fibers such as sisal and sea grass. 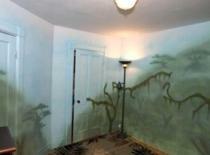 A painted waterfall or waterhole. 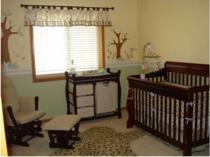 Natural fibers can be incorporated by adding a large nursery area rug or by including them in your window treatments. 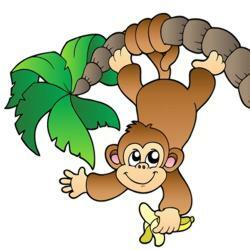 Add monkeys swinging from the trees or vines. A leopard lazing on a branch. A lion lounging under the tree in the shade. A hippo or two wallowing in the waterhole. An elephant swinging his trunk in the breeze. A zebra munching on the grass nearby. A giraffe craning its neck to reach the uppermost branches. If you decide on a vintage jungle theme, vintage Rudyard Kipling Jungle Book posters are a great starting point. 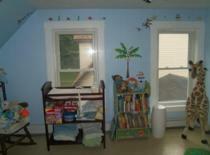 Add an old copy of The Jungle Book and some old fashioned stuffed animals. 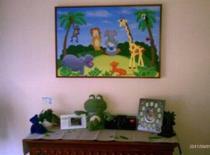 If you want to go for a cartoon type jungle theme, you can base your theme on the modern Jungle Book or Madagascar movies or the stories of Curious George. 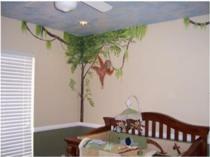 For a more authentic look of the wild you'll need to fill your walls with a jungle mural. 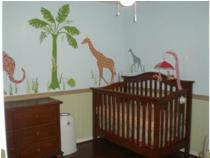 If you don't feel up to painting the whole thing just paint the background and then add trees and animals using these gorgeous nursery stickers. You can't go wrong! 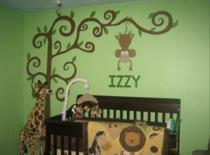 If you include a tree in your mural you can paint your baby's name across one of the branches or attach nursery wall letters to the Leopard's dangling tail. 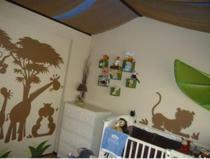 You can enhance the illusion of a safari by draping burlap from the ceiling to create a tent effect. 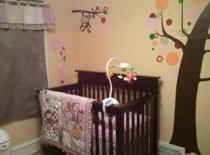 Add to this by draping netting over the crib to represent a mosquito net. How about sticking glow in the dark stars to the ceiling to create an out-of-doors night sky? 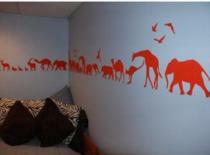 Another great idea is to paint your animals all the same color as silhouettes. 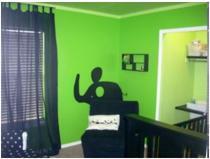 You can do this in almost any color. 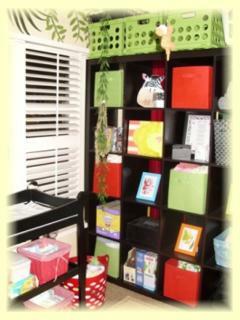 This is an idea that works really well for a modern jungle nursery. 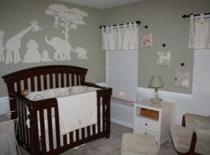 Animal prints also fit well in a modern jungle theme nursery. 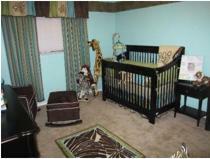 Think zebra, giraffe or leopard. Don't forget to cozy it up by adding lots of cute and cuddly soft toys. 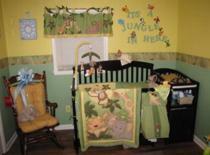 And last but not least, make sure you include some storybooks with a jungle theme on the bookshelf. What better way for your baby to learn about the thrill of the wild than by hearing about it while he perches on your knee?